"Couldn't complete the last command because there is a problem decrypting the file. In order to use TiVo files, you need to first enter your Media Access Key (MAK) in the preferences dialog of the TiVo To Go application." All of the .tivo files were transferred under the same setting, so I don't know why there would be a problem with some files and not others. 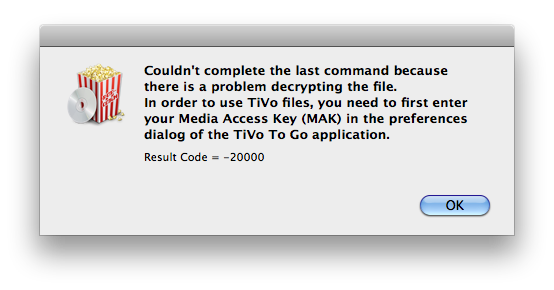 Also, I can't find a TiVo To Go app on my Mac and don't remember ever having used it. The only place I've had to enter the MAK was in the TiVo Transfer program. Any ideas on how I could solve this problem? I don't know what to suggest. I don't understand why you are using TiVo Transfer from Popcorn 4 but using Popcorn 3 with those transfers. Did you mark the box to enable TiVo transfers in Popcorn's setup? You can run through that setup again via a link in the Help window. Did you add the TiVo file to Popcorn by using the Popcorn media browser or by clicking the link in TiVo Transfer. There isn't a TiVo to Go app any more. TiVo Transfer is what it's called. I upgraded from Popcorn 3 to Popcorn 4, and found the TiVo Transfer 4 to be an improvement over TT 3; but in Popcorn 4, TiVo has limited the max resolution size to 480x360 at 29.97 fps. Under Popcorn 3 I can still convert to 1280x720 at 59.97. So for my main purpose Popcorn 4 was not an upgrade at all. At any rate, I got the error message when dragging the file from the finder into Popcorn 3, but just checked and get the same error when adding from within Popcorn's media browser. The only thing I can suggest is to download TiVo Decoder and use it to remove the TiVo wrapper. Then you have a MPEG 2 file that can be converted in Popcorn 3 or 4 without any rescaling. I don't know why you're having the trouble with that transfer. I would expect the MAK issue to only be a factor in making the transfer from the TiVo.